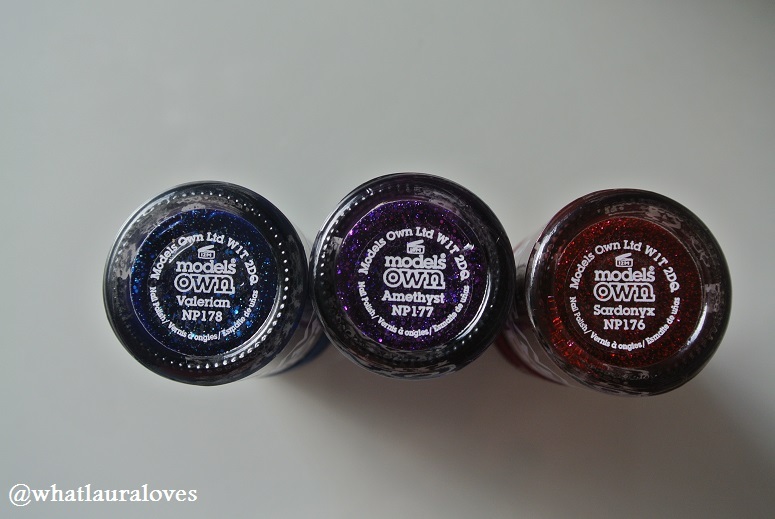 My all time favourite nail polish brand, Models Own, have released a new collection ready for the autumn winter. When I first saw these I thought that they were going to be like the velvet manicure that Ciate released last year which was like a overly textured, fuzzy nail offering that quite frankly, was a pain to apply and pain to remove. 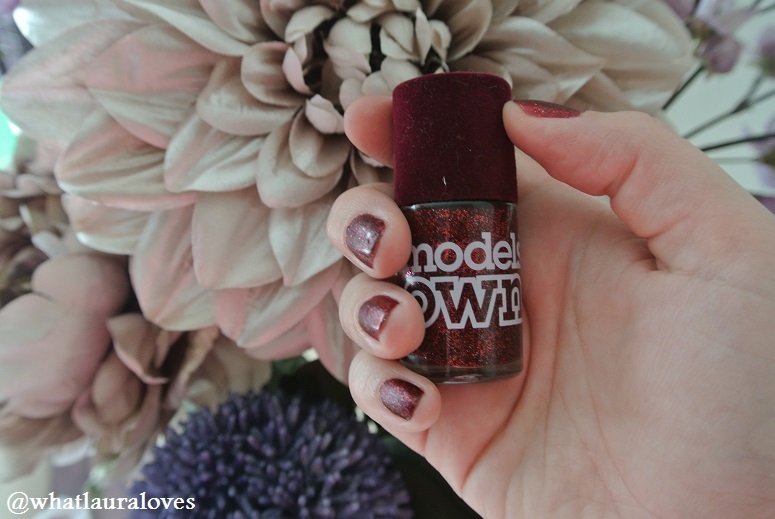 Thankfully, Models Own have created a collection of polishes with all the velvet appeal you could dream of, minus the fuzz. There are 5 14ml polishes in the collection, each with a dark and mysterious inky hue. There is a deep emerald green shade called Absinthe, a deep charcoal grey called Obsidian, a stunningly rich bottle blue shade called Valerian, a gorgeous blood scarlet red called Sardonyx and a beautiful royal purple called Amethyst. The latter three polishes, I was kindly given by Models Own and I’ve been trying them out recently. 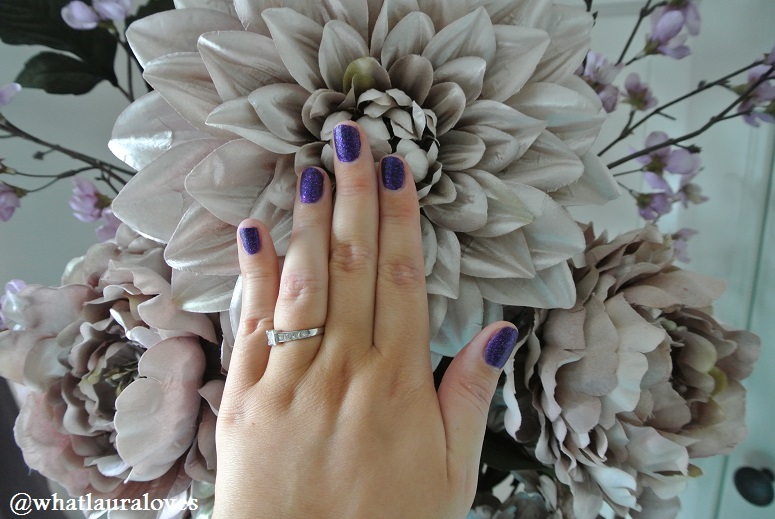 Amethyst is perhaps my favourite out of all of the polishes I tried, mainly because of the gorgeous Cadbury’s purple colour. It is bright but has a lot of depth to it, as do all of the Velvet Goth polishes, and it has gorgeous purple micro shimmer particles combined with large glittery pieces running through it. I have a jumper in a similar royal purple colour that I can’t wait to wear this with and be all matchy matchy but I’ll have to wait a couple more months for the weather to cool down before that can happen! Through using these polishes I can definitely see that they do draw some comparisons to the traditional Models Own polishes in that they are quick to apply with the fantastic brush (not too wide, not too thin) and fast drying however they do have some notable differences in that they have a textured finish, nothing too gritty or noticeable but they’re textured nonetheless. The texture comes from the large glitter particles and multi faceted shimmer within the polish. Another noticeable difference is the packaging. Whilst the bottle shape and size are the same, gone are the white lids and instead each bottle has a limited edition, fuzzy velvet cap in a colour to match the polish. Super cute! All of these photographs were taken without using a base or top coat so that they show a true reflection of the polish. Remember that textured finish I talked about earlier? If you want a completely smooth finish then you could add a top coat. Be careful though as this may give the nails a glossy finish too which is great if you like that look but with the Velvet Goth collection, it is all about the matte sparkle. The finish of the nail polishes on their own is very two dimensional, giving a nod to a velvet appearance and a deep gothic feel. They’re super matte but sparkly at the same time so they look glamorous and would perfectly compliment an evening outfit. Two coats is definitely needed when applying all of these as only one coat does not give you the depth of colour that two gives. Like I mentioned earlier, they are fast drying however it is important to try to keep the layers of polish application thin as with this being quite a textured polish I do find that it has a tendency to dry slightly and go a little gloopy, particularly by the time the second coat comes around. This is easily solved by making sure the lid is replaced when you wait for the first coat to dry and giving the bottle a good shake before opening it again. I’ve found that the more coats of polish you apply, the deeper and darker the colour of the nail polish appears however two coats is more than sufficient. One thing that I really like about these polishes is that they are surprisingly easy to remove. Usually I find that heavily textured or glittery polishes are a little tough to get off to say the least but these were quite straightforward after holding a nail polish soaked cotton pad over the nail for a few seconds first. The Velvet Goth collection launched worldwide on the 24th August at the Models Own Bottle Shop but they will be much more readily available online from the 2nd September on the Models Own website. From 4th September they’ll be heading into Boots stores nationwide and into Superdrug from 25th September. They are a purse friendly £5 each. Get the dates in your diary girls! My favourite is the amethyst! Hurry up 25th of September! A definate must have! Lalee x.